Jewish Pattern Instructions See my BEADIE PAGE, for basic instructions. 3 feet of cord or curling ribbon. Make sure to keep the ribbon/cord loose when you get to row 3 and after 7 to allow for the longer rows. Otherwise it will curl. 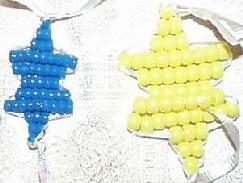 To see great instructions and diagrams with arrows explaining how to make my design in blue and white beads etc. 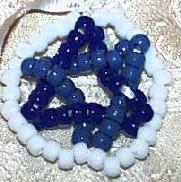 see Making friends.com Eileen's Star of David Pattern. 1 1/2 feet of cord. The bumps of the horn are made by not doubling through(skipping ) one bead as you start the next row. 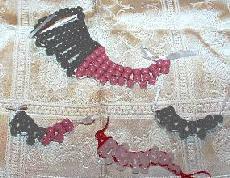 To Twist like a Yemenite Horn alternate sides of rows for the skipped bead. See Ronin's all glow in the dark one in middle of small pictures. 3D designs can be tricky. String on 16 white beads on each cord. Twist cord to make circle of white. string on 8 light blue . Twist cord between the 5th and 6th bead on your left side of the white circle. 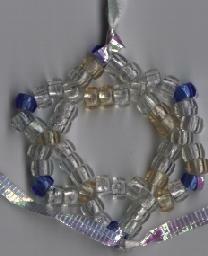 String on 8 light blue beads. Twist cord between the 5th and 6th bead on the right side of your white circle. String the last 8 light blue beads. Go through the 5 white beads on the bottom left. String 8 dark blue beads. Twist cord around the middle of the top of the white circle. String on 8 dark beads. Twist around the cord between the 10th and 11th bead on the right of your circle. String on the last 8 dark blue beads. Twist cord around the same space you started the dark blue row. Double back the remaining white beads to the starting loop. and twist and tie off. WOW! The Mezzuzah's picture just did not come out as clear as we would like. The rows are : first row 1, second row 4, third row 5. Micah used glow in the dark beads. SO they started to glow when his ABBA scanned them! Tallit are often white with stripes. The blue band is the neck piece where the prayer usually is. He put extra ribbon for the fringe. 5 beads for the neck band. Beadie Tallit Pattern - designed in honor of Rosh Hashana for Shalom Boston.com. Clicking on the picture will take you to Shalom Boston.com you will have to click back to get back to this page when you are done. I had to laugh when I saw the colors of the beads in this picture! We used a computer scanner instead of a digital camera and it seems to have added a lot of light. I thought I used all clear and transparent blue. Some must have been color changing or gold. 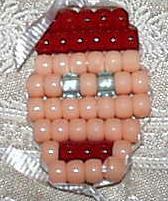 Plus I skipped a clear bead and if you count the beads in the picture carefully, you will catch my mistake. Oh well.. The directions here are a bit complicated! 1. String on one blue bead on one cord. Double back through. 2. String on 5 clear beads on one cord. 3. String on one blue bead on same cord and go back through with the SAME cord. 4. Repeat steps 2 and 3 - two times. 5. Take other cord. 6. Repeat steps 2 and 3 - three times. 8. Weave one cord back through 3 clear beads on left. 9. String on 3 clear beads. 10. Go through the center clear bead(the third one)of the outer circle. 11. Repeat steps 9 and 10 - six times. 12. Weave back through the 2 clear and one blue of the bottom left center. 13. Tie off. Pat your self on the back!